Global Indian International School, Singapore’s leading international school in Dubai, is looking for dynamic teachers for its campus. Those who have the passion and commitment of maintaining our global standards and fulfill our qualification criteria, may apply. Its a direct and free recruitment by the School. 3) Mother Teachers (Grades 1 and 2): Graduate in any subject (Arts/Science/Humanities) with B.Ed. 4) Social Studies Teacher: BA and B.Ed. with subject specialization. Experience of 3+ years in the UAE. BA and B.Ed. with subject specialization. Experience of 2+ years in the UAE. 6) French Teacher: Specialist teacher with a good command of the language. Candidate with a degree, plus teaching experience in the UAE required. 7) Lifeguard: Graduate in B.P.Ed. Lifeguard experience of 2 years in the Gulf. MA and B.Ed. with specialization in English. Experience of 3+ years as a department head. M.Sc. and B.Ed. with Science subject specialization. Experience of 3+ years as a department head. 12) Math HOD: M.Sc. and B.Ed. with Math subject specialization. Experience of 3+ years as a department head. 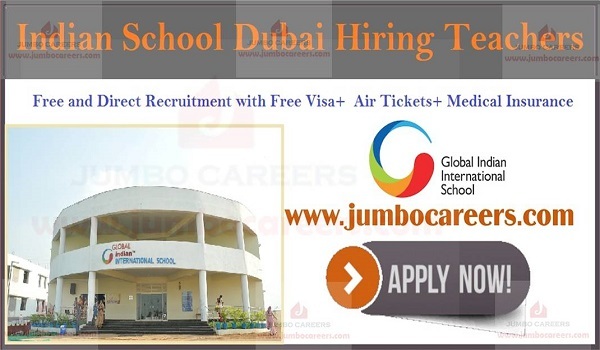 How to Apply for teachers jobs in Global Indian School Dubai 2019?